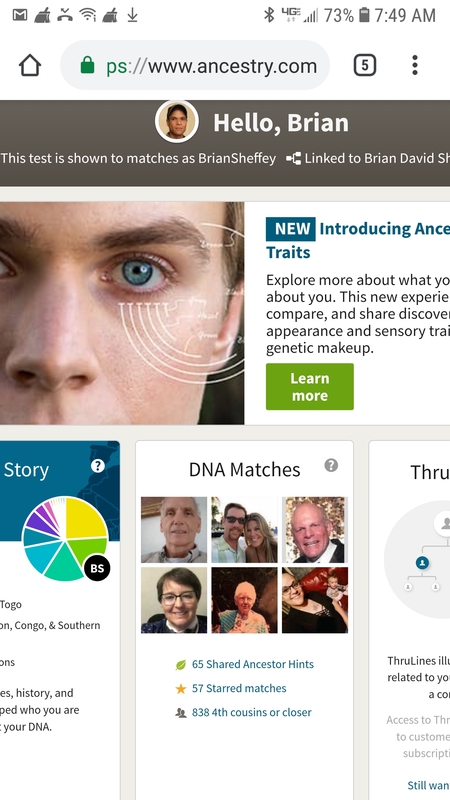 It is fair to say the online genealogy community has been set alight with the launch of new research and DNA analytical tools from AncestryDNA and MyHeritage. I can understand and appreciate the excitement. MyHeritage’s new AutoCluster and The Theory of Family Relativity (ToFR) offerings have enabled my to smash through a handful of my most stubborn genealogical brick walls. It shouldn’t come as a surprise that the new analytical and research tools have generated quite a bit of commentary online: ranging from euphoric to harsh. While the merits of ThruLines, AutoClusters, and ToFR are being discussed and debated, I am going to share my thoughts from a perspective that isn’t being discussed within the wider genetic genealogical community. What do I mean by “highly admixed people? I mean individuals whose genetic inheritance and ancestry is evenly spread across more than one different ethnic group. In my case, that would be a DNA admixture that is evenly spread between African, non-Jewish European, and Jewish European. I’ll leave my smaller amounts of Native American and Asian (Central, Southeastern, and Far Eastern) DNA to one side for now. For the purposes of this article, I will be referencing AncestryDNA, MyHeritage, and FamilyTree DNA. I haven’t tested with 23andme. If you have tested with 23andme – and are highly admixed – I would welcome hearing your thoughts and/or experiences in the Comments Section. One caveat: I will not be referencing ethnicity percentages. Ethnicity percentages are not the focus of this article. I will begin with my experience with AncestryDNA. One thing has consistently bothered me about AncestryDNA. It has taken the roll out of its ThruLines to bring what has nibbled me about the service into sharp relief. AncestryDNA certainly “sees” my European and Jewish Ancestry in the form of its ethnicity breakdown, and the sheer volume of Jewish and European-descended DNA cousins on my match list. However, it has rarely – and I mean rarely! – facilitated common ancestor matches. This is despite the fact that I have a large and well-researched tree. Ancestry DNA has readily matched me to other African American cousins, either through its DNA Circles and Shared Ancestor Hints. I can’t say the same has happened with my Caucasian DNA cousins – even when we’ve worked out how we are related through paper trails. In a recent message to AncestryDNA, I stated that I felt (and I stress the words I felt) that there was a virtual One Drop Rule at play, or a kind of DNA apartheid. I explained that what I meant by those terms was this: whatever coding algorithm AncestryDNA was using seemed to focus on my African American DNA to the exclusion of everything else. Please don’t misunderstand the point I am making. My African DNA is important. However, in terms of weighting, it accounts for just over one-third of my Ancestry. Yet, Ancestry’s analytic tools predominantly focuses on just this ancestry. I am greeted by six thumbnails of beaming, happy, Caucasian DNA cousins. So, at this level, AncestryDNA is affirming something I know already…I have quit a bit of European ancestry. Notice anything in the three historical overviews? Not yet? They are solely for my African American ancestry. I should have, at the very least, a Jewish Diaspora story for my Jewish DNA. I should also have multiple European stories that cover my colonial Quaker, Irish, British Isles, and Ulster Scot ancestral migrations. These ommissions are glaring. So why is this imporant, and why does this irritate me so much? Well, despite how it happened, I have white ancestors. Numerous white ancestors, to be precise. Understanding the connection between my mulatto ancestors, both free and enslaved, and their white forefathers and foremothers is critical. Why? More often than not I can only find documentation for my African American ancestors through their white family members. I can only piece together my family’s broken African American family lines by connecting them through their shared white ancestors. If AncestryDNA’s coding prevents this from happening, that simply throws hurdles in my ability to piece my enslaved ancestor’s fragmented and slavery-disrupted histories. For my ancestors who were free people of color, this impedes my ability to understand their origin stories, as well as obscuring their migration stories into the parts of America that would become Kentucky, Tennesse, North Carolina, and Ohio. This is especially true for my ancestors who were free people of color who assumed white identities when they migrated into the places listed above. This group in particular lived in remote places in the early colonial period. There were no colonial offices for them to register births, marriages, and deaths. There were no formal churches to register the same information. Like a number of my formerly indentured Irish, British Isles, and Ulster Scots ancestors, illiteracy was more the norm than not: so no scribbling of births, marriages, or deaths in the family bible. In truth, there might be family oral histories regarding their ancestry, but those are patchy at best. There is one tool to make the necessary familial connections: DNA. To be clear on another point, I am not saying that AncestryDNA is racist. It’s sad and disheartening that I even need to say that, however, considering the times we currently live in, I need to say this just to be clear about it. What I am saying is AncestryDNA needs to re-examine the coding that drives its matching algorithm, which, in turn, drives the various analytic tools on its service. MyHeritage sits at the other end of the spectrum. Its DNA and research tools, thusfar, sees all of my admixtures. Nowhere is this more apparent than its AutoCluster tool. It is for this reason I have been able to obliterate some brick walls that were decades old. MyHeritage’s ability to “see” and understand my heavily mixed admixture is so much better that I will be doing the majority of my DNA analytic work on its service. Whatever coding it uses to drive its matches my reports and DNA analytic tools works with my research, and not against it. As for FamilyTree DNA? It sits somewhere between AncestryDNA and MyHeritage. Personally, I find FamilyTree’s Chromosome Browser to be a stand-out DNA analysis tool. It is something to use regularly. If you too are heavily admixed, I’d love to hear your thoughts, both positive and challenging. And, if you work for AncestryDNA, my standard invitation still stands. I am more than happy to consult with you on this. This is something that needs to be addressed. Thank you for this thoughtful post. I am not what I would call “heavily” admixtured, but I am definitely, shall we say, on the spectrum!! I am about 10% African American through two or three family lines (SC, VA and New York, all pre-1850), a smidge Native American (likely only my SC line), nearly 40% Norwegian, and on Ancestry, the remainder is now called the weird, cop-out bucket of England+Wales+NorthwesternEurope… (whatever). I have a German paternal great GM and Anglo-Saxon roots way way back on my maternal great GM’s side. Your post hits at exactly what my African-American cousins and I have been seeing for some time now. I have assumed that the issue lies in the rate at which our African American community chooses to test and chooses to create a family tree, as far back as we can. But your comment points to a potential internal issue with the coding and the specific sequences A. is using to match. Thank you again and please keep us updated!